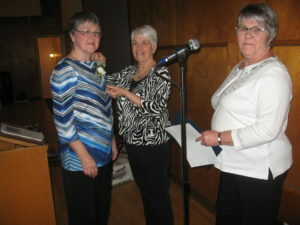 Annual Service Award | Southwest Branch - Manitoba Genealogical Society Inc. The Ruth Tester Memorial Award was inaugurated in 1983 as a memorial to a genealogist’s model. Early in her adult life and with the aid of her father, Ruth began to research her Heal and Cater families. She was able to extend her research as far back as the 1700’s in England. Her interest in genealogy led her to become a charter member of the Manitoba Genealogical Society Inc. and she was instrumental in the chartering of the Brandon and District Branch in 1978. It is fitting that Ruth helped the Branch celebrate its 10th Anniversary in 1988 just a few days before her death. Ruth left a legacy of cemetery transcriptions and obituary abstracts as a memorial to her devotion to the Branch. The award is made annually to a member of the Branch who, in the opinion of her/his peers, exemplifies the spirit of service to genealogy and the Branch. In 1993 the first recipient of the Ruth tester Award was Ruth Phillips. The following are the recipients since the 1st award in 1993: Tom Stacey, Meta McCulloch, Betty and Blair Loree, Myrtle Grieves, Alvaretta McManus, Margaret Goodman, Beth Wall, Jim wall, Lloyd Duncalfe, Marg Cochrane, Sheila Shearer, Doug Freeman, Shirley Erskine, Barb Andrew, Vivian Privat, Barb Pettinger, Gladys Patmore, Jack Dodds, Eleanor Burch, Bernice Still, Denise Bromley, Laura Crookshanks, Grace Desjardin Green, Paul Voorhis and Stacey Shackel.